You don't get much more "my kind of game" than Legend of Grimrock . I was a big fan of dungeon crawlers back in the day, and being able to return to the genre in a game that managed to be contemporary while remaining wonderfully true to its progenitors was incredibly satisfying. That it was a big success for developer Almost Human Games made it even better, because that made a sequel possible . And in about a month, it's going to be here. Legend of Grimrock 2 will again feature a group of prisoners thrown together by unfortunate circumstance, but this time they've been shipwrecked on the Isle of Nex. 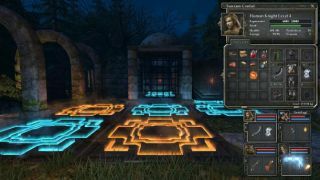 That may well constitute the bulk of the plot, but that's okay; the original Grimrock didn't offer much more than that, and dungeon crawlers aren't generally known for being big on story anyway. Thin narrative framework aside, this new trailer makes Legend of Grimrock 2 look considerably bigger than the first game, thanks to the wider variety of environments on display. Gameplay doesn't appear to have changed in any meaningful way, which is no surprise, and there are 30 new monsters on tap, along with a dozen old favorites. Almost Human says the game will provide more than 20 hours of "pure-blooded dungeon crawling," while user-made adventures will be supported through an included editor. Finally, the release date: Legend of Grimrock 2 goes live on October 15. Preorders, discounted appropriately as is the way, may be placed at Grimrock.net .